The data plans come bundled with a 22-channel IPTV service, free calls to TM numbers and free broadband equipment worth RM800 but all subscribers will however have to commit to a 24-month contract. Comparatively, look like TM’s UniFi is MORE Expensive than SingTel-Singapore! RM1bil initiative to provide schoolchildren from poor households with Internet-enabled netbook computers and promote high-speed broadband usage. Prime Minister Datuk Seri Najib Tun Razak announced the National Broadband Initiative at the Dataran Merdeka in Kuala Lumpur on Wednesday night. UniFi heralds a new age of digital lifestyle with a faster, richer and more reliable online experience. UniFi is a bundled triple play service offering High Speed Internet, HyppTV (IPTV) and Voice. More information can be found in tm.com.my. 2) What is the UniFi package offering? UniFi is offering 3 residential and 3 business packages. For residential VIP5 is RM149 a month, VIP10 is RM199 a month and VIP20 is RM249 a month. Each package comes with voice, different Internet speeds and either a basic or premium HyppTV subscription. 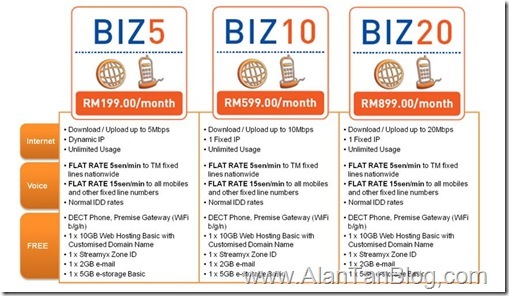 For businesses, BIZ5 is RM199 a month, BIZ10 is RM599 a month and BIZ20 is RM899 a month. Each package comes with attractive call plans, different Internet speeds and a host of complimentary services. 3) What is the difference between TM IPTV and other satellite TV operators? TM IPTV is different from other satellite TV operators in that it is transmitted via a broadband network. This gives you added benefits such as not being susceptible to bad weather, as well as fast Internet access via IPTV. Being a broadband platform, you can also expect other IP-based services in the future. TM IPTV also differs in term of the pricing model, which is an On-Demand approach, which means you pay only for the channels, movies or series you want to watch, rather than pay for the whole package, with no extra monthly fees involved. In addition, the service delivers Series on Demand such as, CSI past season/Hollywood Premiere, which gives local viewers exciting and extraordinary content. 4) How can UniFi benefit me? You will be able to experience the highest speed connection available in the market and this will enable you to tap into many services such as online games, downloadable rich content, virtual interaction (video calls) and an enriched shopping experience (rich multimedia virtual shopping, real time merchant tips). UniFi provides more stable and reliable connections to ensure a premium customer experience. 5) How do I check service availability in my area? You can check service availability by calling TM UniFi Centre at 1-300-88-1222 or visiting selected 6 TMpoint outlets currently in the HSBB areas: Taipan Subang Jaya, Damansara Utama, Menara TM, Jalan Raja Chulan, Shah Alam and Bangsar. 6) How do I subscribe to UniFi? Interested parties can register their interest for UniFi at TM’s website www.tm.com.my, call TM UniFi Centre at 1300 88 1222, or visit selected 6 TMpoint outlets currently in the HSBB coverage areas: Taipan Subang Jaya, Damansara Utama, Menara TM, Jalan Raja Chulan, Shah Alam and Bangsar. 7) What are the charges like – installation fee, hardware rental, contract duration, etc? There will be an initial promotion, waiving charges for standard installations and activations worth RM300. In addition, the standard package is inclusive of equipment worth RM800 that will be given free-of-charge to customers. No deposit will be imposed. Only monthly subscription fees for UniFi packages will apply. Telephony usage charges and any purchase of value added services will be charged separately. For more details, please visit www.tm.com.my . The duration of standard contracts is 24 months. 8) How long is the expected installation waiting period for new subscribers? We will be informing new subscribers of the expected waiting period for their specific case. In the first few months of operations, TM will be adjusting its resources to cope with the demand for UniFi. 9) How long does a typical physical installation and testing take? The expected installation and testing will take approximately 4 to 8 hrs depending on the type of premises and the sensitive nature and complexity of fibre installations. An installation involves a site survey, ducting, piping, electrical work and equipment configuration. 10) Does TM allow customers to appoint their own contractor to perform internal wiring? Because TM is ultimately responsible to ensure that the highest quality of service is delivered to customers, we will not allow unaccredited contractors to perform the installation of the service. Only TM or its appointed agents can install the fibre at the customer premise. That said, some customers will want to do additional enhancements in the internal wiring and they might opt to use additional third parties for this. But as TM, we need to ensure that the service is working properly upon our installation and with very high quality. 11) Does UniFi have a Fair Usage Policy (FUP)? Does the FUP differ across packages? Yes, UniFi packages are subject to Fair Usage Policy. FUP is a standard global practice to ensure that a good quality of experience is provided to all customers. UniFi packages for consumers (not businesses) come with a volume-based allocation and monthly download volume is capped. However, the FUP will not impact customers who do not exhibit abusive usage behavior, and will not impact the delivery of IPTV and value added services. This entry was posted on Thursday, March 25th, 2010 at 12:53 pm	and is filed under Advertisement. You can follow any responses to this entry through the RSS 2.0 feed. Both comments and pings are currently closed. Telekom Malaysia (TM) has announced the packages and rates for its High Speed Broadband (HSBB) service called UniFi, promising to deliver a premium online experience at affordable prices. In a statement, the company said UniFi delivers faster network access speed (port speed) for bandwith hungry applications and superior end-to-end performance. It comes with triple-play services of high-speed internet, video (IPTV and Video on Demand (VoD) and phone. For residential customers, the packages and their respective monthly prices will be 5Mbps (RM149), 10Mbps (RM199) and 20Mbps (RM249). UniFi subscribers will also enjoy 22 free linear TV channels and VoD titles refreshed every month as a value-added service. These channels are delivered via an 8Mbps connection exclusively and in addition to the the data speeds of 5, 10 and 20Mbps they subscribe to, the company said. “With IPTV, customer can be in control of their TV as they watch the programmes according to their own schedules – no more fixed programme schedule to follow. IPTV also provides platform for interactive applications for customers to enjoy,” TM added. UniFi subscribers also pay no installation and activation charges for equipment such as their residential gateway unit, set top box and optical network unit, worth more than RM1,000. There is no deposit required as well. New and existing 4Mbps Streamyx Combo and non-Combo customers will only pay RM140 per month effective immediately, regardless of their location. This is to encourage 4Mbps Streamyx subscribers located in areas where UniFi is available to upgrade to UniFi and for those outside to switch to the Blockbuster package, the company said. For business customers, UniFi packages come with the same speeds but are packaged without the IPTV and VoD. The prices are RM199 (5Mbps), RM599 (10Mbps) and RM899 (20Mbps). UniFi offers a compelling value proposition for businesses to exploit the full potential of already familiar enterprise-class communication tools such as hosted web-based group messaging, Customer Relationship Management, Enterprise Resource Planning and Supply Chain Management. In the near future, UniFi subscribers will be able to enjoy a wide variety of third-party services and applications, including telecommuting, security and surveillance, interactive channels and gaming, and many more services which will be developed by TM’s value-added service partners to enhance the ecosystem. This potential is limitless. The launch of High Speed Broadband (HSBB) service and the National Broadband Initiative (NBI) bodes well for Malaysia’s global competitiveness, says Intel Malaysia. In a statement today, the company said with the new infrastructure and all the incentives, Malaysia was more bullish on achieving and even exceeding the 50 per cent household penetration target. “The ecosystem has all the necessary building blocks to deliver. We now have to put them in motion and execute to plan,” said Intel Malaysia country manager, Ryaz Patel. Prime Minister Datuk Seri Najib Razak yesterday announced six national broadband initiatives to transform Malaysia into a developed and high-income country. Meanwhile, Red Hat Asia Pacific, Malaysia country sales manager, Basheer Ali Majeed said HSBB services have become a necessity in today’s globalised and connected world. “So, we at Red Hat appluad the government’s announcement on the deployment of the HSBB nationwide network,” said Basheer Ali. Cisco Malaysia’s managing director, Anne Abraham said making broadband a national priority would definitely help Malaysia become more competitive globally. “Connectivity alone is not enough as we are only as strong as the systems and infrastructure we have,” she said. “In taking the NBI to the next level, we should explore and creatively use next generation broadband technologies to create smart and connected applications and communities in Malaysia,” she added. Telekom Malaysia’s new high speed broadband service for residential subscribers will be priced at RM149 for the 5Mbps package, RM199 for the 10Mbps package and RM249 for the 20Mbps package. The telecommunications company announced the packages in a briefing to the media today. The data plans come bundled with a 22-channel IPTV service, free calls to TM numbers and free broadband equipment worth RM800. Subscribers will however have to commit to a 24 month contract. The company is going all out to try and lure customers to sign up for the service and is waiving installation and activation charges of RM300. Telekom CEO Datuk Zamzamzairani Mohd Isa however tried to manage expectations during a media briefing today saying that as a new service, there would be some hiccups. “Please expect some ramping up period as we ramp up our capability,” he said. Installation of the service is expected to take between four and eight hours. He added that the prices of the company’s Streamyx broadband service would also be looked at again, starting with the 4Mbps package which will be re-priced from RM160 to RM140. In terms of quality of service, he said that the company would comply with the guidelines set by the Malaysian Communication and Multimedia Commission. He declined to confirm if the service would continue to be provided on a “best-effort” basis but said that quality would be satisfactory enough that customers would not be inclined to check if they are getting the actual promised connection transfer rate. He added that Telekom is expanding its international capacity but also trying to get more content hosted locally to reduce outbound traffic. Zamzamzairani declined to provide targets in terms of number of UniFi subscribers but said that he expects Telekom to start registering revenue from the service in the second half of the year. There will be a usage cap and subscribers who exceed the cap will have their broadband throttled. Telekom does not provide software for customers to monitor their usage but said it would look into it. UniFi’s IPTV service has fewer coveted channels than rival Astro’s satellite based service but Telekom said it will continue to improve its offerings and said that it would focus on the video-on-demand aspect of the service. Telekom is also opening its network pipes for other content providers to come aboard on a commercial basis and more providers are expected to be announced by June this year. I would like to congratulate TM for launching its new High Speed Broadband. Although the pricing has not been released yet, most domestic users are not bothered because I do not think many domestic consumers will be subscribing to it. I wonder why TM embarked on this so-called High Speed Broadband project when even its present “low” speed is not maintained properly. This month alone, I had a “port” problem thrice. I was unable to read my Streamyx webmail from overseas. As consumers, I do not believe we should accept this kind of answer. connection problems takes up to 24 hours. In this time of high speed broadband, 24 hours seems like a millennium. To TM, I suggest you look into the present problems of Internet access by going through all the reports and complaints to your customer service department. Solve our daily problems first before further expanding your High Speed Broad­band. After the excitement of Telekom Malaysia unveiling UniFi, its high-speed broadband service that offers Internet speeds of up to 20 megabits per second (Mbps), the bubble burst for many consumers here. Some are disappointed over what they feel are expensive charges for the packages for home users: RM149 for 5Mbps, RM199 for 10Mbps, and RM249 for 20Mbps. But the real disappointment is the realisation that the UniFi packages have a cap on the amount of data that can be downloaded. The consumers bristled when they learned that the 5Mbps service is capped at 60GB of data per month. The 10Mbps service is capped at 90GB while the 20Mbps service has a 120GB cap. They were even more disappointed to learn that the data download caps are calculated on a daily basis. Consumers were further horrified to learn that if they exceeded their daily download limit, their high-speed broadband connections would be throttled down to about 10% of the purchased speed. Telekom Malaysia CEO Datuk Zamzamzairani Mohd Isa said at a press conference to announce the UniFi pricing yesterday that the measures were part of its Fair Usage Policy. Prime Minister Datuk Seri Najib Tun Razak launched UniFi at the Dataran Merdeka in Kuala Lumpur on Wednesday night. 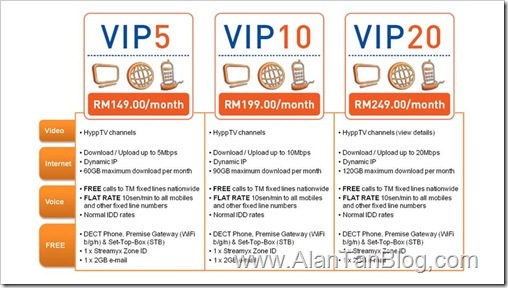 Telekom Malaysia Bhd (TM), which has just launched it high speed broadband (HSBB), UniFi, is maintaining the pricing for most of the packages offered under its current broadband service, Streamyx. Group chief executive officer Datuk Zamzamzairani Mohd Isa said although TM had introduced the 5Mbps basic pacakage for UniFi, it was maintaining the prices for its current 1Mbps and 2Mbps by Streamyx. “Broadband packages have never been on an uptrend,” he told a media briefing yesterday. However, TM is offering new and existing 4Mbps Streamyx combo and non-combo customers a rate of RM140 a month effective immediately regardless of their location. The current fastest available broadband speed for the general public offered by TM is 4Mbps. According to the Streamyx website, the 4Mbps package which includes Streamyx hotspot, e-browse (online newspaper) and BB Phone (voice over broadband) is currently priced at RM268 per month. “This (price revision) is to encourage 4Mbps Streamyx subscribers in areas where UniFi is available to upgrade to UniFi and for those outside to switch to the blockbuster package,” Zamzamzairani said. TM’s UniFi packages comprise triple-play services of high-speed Internet, video (IPTV) and phone, with speeds of 5Mbps, 10Mbps and 20Mbps. The 5Mbps package is priced at RM149 per month, the 10Mbps at RM199, and the 20Mbps at RM249 with a two-year contract. According to HSBB project programme director Ahmad Azhar Yahya, all the packages include a digital enhanced cordless telecommunications phone, a set-top box for IPTV (Internet Protocol television), Streamyxzone ID for wireless web access and a 2GB e-mail box. Ahmad said these channels would be delivered via an 8Mbps connection exclusively and in addition to the data speeds of 5, 10 and 20Mbps subscribers subscribed to. TM was waiving over RM1,000 worth of installation and equipment fees to install UniFi, he said, adding that the installation process could take two to eight hours depending on subscribers’ premises. “UniFi will be focusing on Zone 1, which is the high economic impact areas, industrial parks and free trade zones,” Zamzamzairani said, adding that all other areas not covered by UniFi would be covered in one form or another by other technologies. IS RM149 a month for 5-megabits per second (Mbps) a steal or pricey? It comes with free voice calls, some TV channels and other stuff. That is UniFi, Telekom Malaysia Bhd’s latest offering in high speed broadband (HSBB). In the fast lane of broadband, speed is king. Without speeds of 5-50Mbps, and capacity, don’t call it HSBB. Your waiting time to surf and download with 5Mbps is lower than 1Mbps. It is as though you are driving a Mercedes sports at top speed. If you want faster speed, say 10Mbps, pay RM199 a month and you may feel you are at the wheel of a Ferrari or Porsche. But if you are one of those speed-hungry surfers, fork out RM249 a month for 20Mbps and you can tell Datuk Seri Tony Fernandes that your speed may surpass his Lotus 1 car. In comparison, Time dotCom Bhd’s (TdC) offer is RM149 for 2Mbps, RM249 for 5Mbps and RM329 for 10Mbps per month and all come with a 50Mbps booster. Today, high speed is here on fixed networks, from TM and rivals TdC and Maxis Communications Bhd in some areas. However, only a small pocket of the population can enjoy speeds of up to 50Mbps. The majority still has a long time to wait as they still have to contend with 256-, 512-kilobits per second or 1Mbps. But change has come, and TM and TdC’s efforts for bringing that change should be lauded. TM is probably the only player globally that sped up the entire process of bringing fibre-to-the-home (FTTH). It also marks the beginning of the end of the copper wire era although the entire phasing out of copper may take up to two decades. What is important the first step has been taken. Both Afzal and REDtone Interna-tional Bhd chief executive Zainal Amanshah were surprised at the competitive pricing. They are not the only two that had expected TM to outprice itself like it normally does. However, those tweeting on Twitter do not think TM’s pricing is reasonable. Whatever the strategy that went into packaging UniFi, it is a clever one; bundling a lot of things without IPTV is not enough for TM to fully monetise its fixed line assets. Zainal also believes it would be tough for players to compete with TM on the retail end if they do not have value-add, including IPTV as TM offers a lot of free stuff for its UniFi packages. But he believes there is hope for those who want to offer high speed using TM’s network to corporate users. Expect teething problems with UniFi over the next six to nine months. But let’s just hope the era of complaints and disgruntled users of TM service will be truly over from now, and TM keeps to its promise of quality and speed. B.K. SIDHU is deputy news editor and hopes the government will intervene to bring down broadband prices for the benefit of the consumers. Broadband providers throughout the nation, and one television broadcaster, will have to keep a careful eye on their market share after TELEKOM MALAYSIA BHD  (TM) on Thursday, March 25, announced a highly competitive pricing scheme for its new high-speed broadband retail offering, also known as UniFi. At RM149 per month for the entry level retail plan, VIP 5, subscribers will receive up to a five megabit per second (mbps) transfer rate. At that speed, a typical song file of about five megabytes in size will take, on paper, eight seconds to transfer. The next plan, VIP 10, subscribers will see a connection speed of 10 mbps for RM199, while the premium plan, VIP 20, will provide subscribers with a speed of 20 mbps for RM249. While critics would argue that TM’s high speed service will only be available in Zone 1 areas, that is, areas of high economic impact, TM’s CEO Datuk Zamzamzairani Mohd Isa announced yesterday at a press briefing that it would also lower the price for its fastest StreamyX broadband plan. The latter falls under TM’s broadband for the general populace (BBGP), which is TM’s broadband offering in areas falling into the Zone 2 category. “Obviously, we need to adjust the pricing for the 4mbps plan on Streamyx. Today, we have the combo package available at RM160, (but) with immediate effect, we will reduce it to RM140,” Zamzamzairani said. The pricing of the plans came after the launch of the National Broadband Initiative and the National High Speed Broadband Project by Prime Minister Datuk Seri Najib Razak on Wednesday night. TM’s UniFi service will be available in Taman Tun Dr Ismail, Bangsar, Subang Jaya and Shah Alam in its first phase of deployment. The rest of the Klang Valley is expected to be wired up for the service by the end of this year. At RM149, UniFi’s cheapest plan is equally priced to competitor P1 Wimax’s premium plan, which promises a maximum connection speed of up to 10 mbps. However, P1 said in its website that the average user experience would see connection speeds of between one and three mbps. RM149 is also equivalent to the price charged by Time dotCom (TdC) for its entry-level high speed broadband plan, Time Fibre Broadband. In TdC’s case, it promises a basic connection speed of 2mbps, which can be boosted up to as much as 10 mbps for a limited amount of time. However, TdC’s service is only available in Desa Sri Hartamas and Mont Kiara in the Klang Valley. Kenanga Research delivered a similar verdict, noting that the smaller broadband players would likely suffer from the launch of UniFi. “We suspect that the odds are definitely stacked against the smaller players including P1 Wimax and to some extent the mobile players which are all likely to see further pricing challenges,” Kenanga said in a note yesterday. TM is also providing an additional sweetener to the pot, namely the free supply of IPTV and a fixed-line phone. TM is boasting video-on-demand for its IPTV service, which means that subscribers can choose what they want to watch and when, as well as free calls to fixed lines in the country. As for its content, TM has also secured contracts with three of six Hollywood studios to broadcast their content, and is providing two high definition (HD) channels along with its lineup. However, Zamzamzairani said that IPTV was not directly comparable with regular TV broadcasters as its unique proposition was its on-demand functionality. Kenanga Research concurred with TM’s CEO on this point: “The IPTV initiative is unlikely to pose a serious challenge to Astro in the near to medium term, (but) it does however put the latter on their toes especially in terms of service delivery and pricing,” the research house said. KUALA LUMPUR, March 26 (Bernama) — Telekom Malaysia Bhd (TM) on Friday clarified that the monthly data volume cap for its consumer UniFi packages will not be implemented immediately. This applies to all Unifi packages offered to consumers — the VIP5, VIP10 and VIP20, it said in a statement. UniFi is its newly-launched high-speed broadband (HSBB) services. In the meantime, TM will monitor traffic and usage patterns to determine and develop an appropriate approach in ensuring that all UniFi subscribers have a positive experience online. The company said it reserved the right to implement a fair usage policy (FUP) as it want to ensure that its subscribers are not seriously impacted by unfair use of the service by a few. FUP is a standard industry practice implemented by fixed line, wireless and cellular data service providers the world over, it said. It will allow TM to mitigate the potential effects of unfair usage on the majority of UniFi subscribers and ensure a superior quality of service for all, it added. Telekom Malaysia has moved to tweak unpopular terms and conditions to its high-speed broadband service, UniFi, just a day after its launch. The telco today said on micro-bloggin site, Twitter, that it will put off imposing the usage caps that were announced earlier, after receiving feedback from the public. “NO volume cap 4 all #unifi packages 4 now. Decision due to public feedback. TM will only monitor usage pattern 4 time being” read the tweet from Telekom. Yesterday, Telekom had said that subscribers of its 5Mbps service will have their usage capped at 60Gb of data per month, while the 10Mbps service will be limited to 90Gb and the 20Mbps service, 120Gb. Subscribers who exceed the quotas will have their connection speeds throttled by about 90 per cent. Many power users felt that given the prices charged for UniFi services — between RM149 and RM249 — they should be allowed unlimited usage. Telekom, on the other hand, feels that some subscribers may “abuse” the service and clog up the network with high-bandwidth traffic, such as file sharing. When contacted, a spokesperson for Telekom said it would be issuing a full press statement later today. The three UniFi packages launched by Telekom Malaysia Bhd (TM) on Wednesday cannot be unbundled and consumers have to take what is offered as there is no a la carte options. This could potentially be an issue for some users who may not want all UniFi offers. UniFi’s packages priced at RM149, RM199 and RM249 per month come with high-speed broadband, IPTV (Internet protocol TV), free voice calls and some other offerings. With the pricing viewed as being on the high side, many wonder if TM could have priced the packages lower by unbundling these offerings. “It is all bundled together, there is (no a la carte),” TM group chief executive officer Datuk Zamzamzairani Mohd Isa said. Consumers may wonder if they are actually subsidising the IPTV and voice offerings, which under the packaging are free or whether TM is subsidising the cost of the items under its three packages. A triple-play network is one in which voice, video and data are all provided in a single access subscription. Globally, the trend is for telcos to move into triple-play to mitigate the flat revenues from fixed-line networks. Zamzamzairani said the UniFi plans came with an additional 8Mbps of bandwidth for IPTV, so subscribers, say for the 5Mbps packaging, would actually be getting 13Mbps. That aside, the market is abuzz over the cap issue that TM has imposed on its UniFi packages. The tweeters on Twitter were vociferous with their comments as they are disappointed with the cap on the download speed. They are even more furious that the data download caps are calculated on a daily basis. TM in a statement yesterday said it would not implement the cap on downloads for UniFi immediately. UniFi’s 5Mbps service is capped at 60GB of data per month, 10Mbps service at 90GB while the 20Mbps service has a 120GB cap. Zamzamzairani said fair usage policy was a standard practice that allowed all users to have the same surfing experience rather than one party hogging the network and the others experiencing throttling speeds. He cited the case of TM Streamyx where 6% of its 1.45 million users were using 80% of Streamyx’s download capacity and the rest had to do with the remaining 20%. UniFi is now available in four areas in the Klang Valley with 311,000 premises passed and it has 500 trial users. Since Wednesday the service is commercially available in those areas. TM has received “positive” feedback on its services but Zamzamzairani did not reveal the number of new users that have signed up since. A special brigade will be set up to rectify broadband and telecommunication connections-related problems in a swift and efficient manner, Information, Communications and Culture Minister Datuk Seri Dr Rais Yatim said. He said the brigade, to be headed by the ministry’s secretary-general Datuk Kamaruddin Siaraf would comprise a team of five individuals, including officials from the Malaysian Communications and Multimedia Commission (SKMM) which would meet weekly to resolve problems faced by the public or service providers. The brigade, he said, would look at all arising matters – from delay experienced by service providers in obtaining licence or permit from the local authorities to erect towers to consumers’ complaints over bad connection – adding this was to ensure the success of the National Broadband Initiative which was recently launched by Prime Minister Datuk Seri Najib Tun Razak. “No efforts should be spared to ensure the success of the broadband initiative. The national target to achieve 50% broadband penetration rate by December must be achieved and. “The brigade will see to it that all problems are solved expeditiously so that they will be no hitches and glitches to meet this objective,” he told reporters after launching the National Spectrum Consultative Committee (NSCC) Tuesday. According to SKMM, the country’s present broadband penetration rate has reached 33.2% or 2.07mil homes. He said that with the government planning to distribute notebooks to rural students, village heads and village security committees in the next few months, it was important to ensure that broadband services were efficient. “The `Broadband for all” initiative will mean better and faster dissemination of information to all. It can contribute to the integration of people of different background, break down barriers, closing digital divide and contribute towards nation building and social inclusion as desired in the 1Malaysia concept,” he added. On the setting up of the consultative committee, Rais said the NSCC would act as a platform for the government, industry and commercial sectors to contribute thoughts on issues, strategies and development of spectrum development towards achieving the nation’s aspiration as a global hub for communications and multimedia. He said that with radio frequency spectrum being a limited resource, it needed to be managed well to enjoy maximun benefits, adding that the committee should actively look for input to help formulate policy for the future use of spectrum. TELEKOM Malaysia Bhd (TM) feels the New Economic Model (NEM) is forward looking, business friendly and comprehensive as it covers all levels of the society and all sectors of the economy. Group chief executive officer Datuk Zamzamzairani Mohd Isa said the key theme emerging from the NEM was that Malaysia must move up the value chain for it to leapfrog into a high-income nation. The Prime Minister had identified as engines of growth National Key Economic Activities which included oil and gas, electronic and electrical, tourism, agriculture and financial services. “For us, this is timely as we recently launched our high-speed broadband service, UniFi,” Zamzamzairani said in a statement. He added that UniFi would be an enabler for these sectors to realise the productivity potential that could be brought about by having access to larger bandwidth. “More importantly, Malaysian citizens and businesses can tap into the opportunities in the social, business, economic and technological spheres provided by a globalised and increasingly connected world,” he said. Zamzamzairani said “while we are leapfrogging Malaysia into state-of-the-art services”, TM was working aggressively to improve the quality of services already in the marketplace. “We will continue to improve our broadband for general population, Streamyx, so that all Malaysians in their own way can participate in the NEM,” he said. ABOUT three weeks after the launch of UniFi, Telekom Malaysia Bhd (TM) can claim to have 900 customers hooked on the new fast speed broadband offering in four areas in the Klang Valley. The next areas where UniFi is heading to are Petaling Jaya, Putrajaya, Cyberjaya, Damansara, Cheras, Selayang, Puchong, Serdang, Klang, Kepong and Wangsa Maju. The first four areas to get the first feel of fast speed were Taman Tun Dr Ismail Shah Alam, Subang Jaya and Bangsar. The service will eventually be expanded to include 22 more exchange areas by June, and another 22 by year-end. By 2011, about 65% of inner Klang Valley will be covered by TM’s HSBB initiative, group CEO Datuk Zamzamzairani Mohd Isa says. This will be increased to 92% by the end of 2011 to include Gombak, Kajang, Bandar Tun Razak and Sungai Besi. UniFi is offered in three packages comprising triple-play services of high-speed Internet, video (IPTV) and phone, with speeds of 5Mbps, 10Mbps and 20Mbps and it is priced at RM149, RM199 and RM249 respectively per month. Zamzamzairani says TM’s target is to complete 750,000 premises passed by the end of the year. Premises passed refers to the number of premises connected by UniFi with the option to subscribe to the service if they so desire. “This means the major part of the Klang Valley will be covered by HSBB by December this year. Outside of the Klang Valley, HSBB deployment will be targeted at Zone 1, which includes the high economic impact areas, industrial parks and free trade zones, he says. UniFi will also be available at Iskandar Malaysia. He says all other areas not covered by UniFi will be covered in one way or another by other broadband technologies. Zamzamzairani warns users to expect teething problems in the initial stages as TM is still ramping up its capabilities. Things will smoothen out after that. TM will not bill subscribers until July. The first 3,000 subscribers within the four exchange areas will be getting free UniFi usage till June. TM is also waiving over RM1,000 worth of installation and equipment fees to install UniFi. CONSUMERS demand Internet services but generally they do not care how it is delivered. The technology can be GSM, WiMax, CDMA, WCDMA or HSDPA, but what they want is a steady and reliant broadband connection without any interruption, while at the same time, one that comes with some speed for downloads. Most Internet users would be content with that. While none of those around me uses dial-up or narrowband anymore, just flashback to the old school connection, 56kbps dial-up which is noisy during dialling. It can be a very frustrating experience as one might need to make several attempts to get connected. Broadband, however, is generally all about the synergy displayed by a modem and a high speed copper or cable line to realise faster Internet access speeds. An industry player says another advantage of the advanced broadband service over the older dial-up service is its splitting of the voice and data (phone and Internet) services using a splitter to enable the consumer to use both the services at the same time. “Above all, broadband Internet connections give faster delivery starting from 256kbps, which is ideal for downloading heavy files such as music and video and online games. On the other hand, dial-up connections are sufficient for just surfing the Internet or checking emails,” he says. Using the highway as an analogy, he says, narrowband is like a one-lane highway whereby only one car can travel at a time. However, with broadband, it is like having a highway with four or six lanes, allowing more traffic to pass concurrently. Today, we have far more newer technology that equips us with faster and better Internet access than a decade ago. Consumers have even greater choices to access the Internet that prompted service providers to compete against each other to capture more market share. All local service providers are having one promotion after another, to attract users. There are a few types of broadband connections available, some are faster than others, and some are more expensive. There are various technologies behind broadband access. Asymmetric Digital Subscriber Line (ADSL), Symmetric Digital Subscriber Line (SDSL), cable and wireless are some of the of broadband connection types available in the country. Other new technologies such as Telekom Malaysia Bhd’s (TM) UniFi fibre-optic broadband and Time dotCom’s Time Fibre Broadband, are now adding to consumer’s choice for higher-speed Internet connections. TM group CEO Datuk Zamzamzairani Mohd Isa says technology will keep advancing and the latest technology is fibre-optics. He adds that copper cable will still be used in other places. “Basically, it provides us with better Internet connection especially with the high speed broadband as well as better user experience,” an industry player says when asked what all these technologies meant to us. “They (consumers) don’t care if it’s Maxis Bhd’s wireless broadband, Celcom Axiata Bhd’s broadband, DiGi.Com Bhd’s broadband, PI Wimax or TM’s UniFi, only that it is available and affordable,” he adds. He says the average Internet users do not care whether it is only 1Mbps, and not 20Mbps, or that the latency is 250 milliseconds instead of 60, unless they do a lot of heavy downloads. The current fastest available broadband speed for the general public offered by TM is 4Mbps. “The 4Mbps is still high speed Internet in my book, and most Internet users would be content with that. However, consumers may take a look at the latest 5Mbps basic package for UniFi. The whole package does look very attractive to a lot of users who have been subscribing to the 4Mbps or 2Mbps packages,” the analyst says. Currently, all 3G players like Maxis, Celcom, DiGi and U Mobile Sdn Bhd offer affordable broadband services starting from RM38 a month. The rate can be as low as RM6 on a daily basis. Another industry player says even if you have the most advanced modem or if you are living in an area where broadband coverage is at its peak, it is unlikely that you will receive the maximum speed advertised by your provider. “The distance from your house to the mobile pole, trees, buildings and other structures between your location and the pole, as well as the number of 3G network users within your neighbourhood will affect the speed of your connection,’ he explains. Apart from the mobile players, WiMax providers like Packet One Networks (M) Sdn Bhd (P1), REDtone International Bhdand Asiaspace Sdn Bhd offer wireless broadband services. Currently, P1 has the widest WiMax rollout nationwide, while REDtone has services in parts of Kota Kinabalu and Kuching. Asiaspace has coverage of 70 to 80 locations in the Klang Valley. YTL Communications Bhd is planning for a commercial nationwide rollout of a 4G WiMax wireless service in July. Analysts says the more popular option among the youth are wireless broadband as they could move about and yet stay connected. An analyst says the true battle isn’t between the competing existing connection type, but between wireless and wired broadband. He wonders if TM will provide free dial-up service to the nation given that the telco is now moving to a higher speed. “The performance and capabilities of new technology will only get better over time, and will represent a direct competitive threat to the existing broadband services. “People will make a choice, just like today when people are disconnecting their wired lines for voice opting for mobile phone,” he says, adding that all service providers need to beef up their services and coverage given the extensive choice consumers have now. Zamzamzairani believes that it is vital to educate the general public of the benefits of the Internet. “Internet is a window to make the world smaller,” he says. With today’s modern world where businesses rely on the Internet for everyday communications and worldwide access, broadband and other high-speed technologies present consumers and businesses an expedient way to hook up to the Internet. THERE is no question of the importance that broadband expansion and enhancement will take the country forward the next several decades. Speed is needed for fast connections to the Web, to undertake business transactions, e-commerce, e-learning, e-jobs and all the E-stuff. Video gets a new face with fast speed broadband and this spurs new areas of businesses such as interactive education, IPTV content, online games and financial services. The content industry gets a huge lift as they now have a bigger channel (or pipe) to transport their creations in video and data format, and that means business for the big and small boys. For the people, it helps to bridge the information gap and creates a knowledge-based society that can use the broadband to acquire new skills, better paying jobs and create new business opportunities. “From advanced nations to developing nations, the arrival of the broadband has led to a change in lifestyle and hike in productivity. Broadband penetration is a catalyst for increased efficiencies in existing economic activities. It also generates new services, which contribute towards increasing the national gross domestic product (GDP),’’ Rais says. If Malaysia achieves 50% broadband penetration, the net effect is a 1% contribution to the GDP. “In the United States, a similar rate contributed to 4% of their total GDP, 15% penetration in Britain resulted in 0.6% growth in GDP, and 50% in New Zealand resulted in 0.9% contribution in GDP. In Malaysia, the communications and multimedia industry’s contribution towards the GDP and gross national product is 6% and 7.6% respectively in 2007, he says. But how is our competitive ratings versus our neighbours who are far ahead in fast broadband? Axiata Group Bhd president & group CEO Datuk Seri Jamaludin Ibrahim believes that “we are ahead in the region in terms of coverage and speed where mobile broadband is concerned and on par with Singapore. “For fixed-line broadband, we are ahead, but maybe not at the same level as Singapore. Internationally, our broadband speed still has some catching up to do, We are at least 3 years behind developed nations. It will take time to improve but it is also about putting money where the mouth is,’’ he says. Malaysia is the world’s 27th most networked economy, according to the Global Information Technology Report 2009-2010 released by the World Economic Forum (WEF) recently. But let’s not forget that Malaysia has had a host of complaints from various industry and chamber groups on the state of our broadband. Often, the complaints are taken lightly, especially by the incumbent and the unhappy investors just go elsewhere where services are better. “Forget the critics as there are fantastic opportunities with UniFi for investors. We want to invite the MNCs (multinational companies) to locate here. We welcome them and (we assure them) the service is good,’’ says Telekom Malaysia Bhd group CEO Datuk Zamzamzairani Mohd Isa. Fast broadband can be a huge draw for foreign direct investments, and tourist dollars. It is about how we manage and give our visitors what they pay for. There are some Malaysians who have access to fast broadband services. The question is, at what price? Hours after TM announced its UniFi rates for its broadband services, there was a hue and cry on the blogs that the pricing was unreasonable. At what price are we getting the service and are those the best rates? Zamzamzairani will have his own argument but the Government has said it will look into making broadband affordable. Singapore’s StarHub, by comparison, is offering a 100Mbps broadband for only S$86.88 (RM202.85) a month while TM is charging RM249 per month for 20Mbps. TM says “don’t compare. That is Singapore.” But TM has to face reality that those are at a rate and speed which are far higher than what it is getting. Consumers were furious over the cap on speeds and within hours of its launch, TM changed its tune by saying it will lift the cap indefinitely. TM’s argument for the cap is that 6% of its TM Streamyx users are hogging 80% of the capacity, thereby causing others to struggle through their connections. In the past, we have been suffering from bad services from the broadband operators, including TM. The speeds are not to the level that were advertised. If we are paying, there should be no comprise and we should switch to the operator who keeps a promise. That goes not just for fast speed broadband, but fixed and wireless services as well. If the FCC is interested to know whether companies are keeping their word and users are getting what they are pay for, then the regulator here must make good their job of monitoring. By so doing, they will be able to check if the delivery is as promised. HSBB is great. It is the way forward and the beginning of new things. As we move along, there are other countries that are ahead of us, and there are others who are behind. But we must remain in the league of those ahead of us. To do that, we have to do more. Having 1.3 million premises passes should just be the beginning. We should have, by now, learnt the lessons of providing bad and inconsistency speed and services. We must also remember that the universal service provision (USP) fund is for those in the rural areas and there should be proper check and balances to ensure that this resources are used for the specific purpose. As an industry expert puts it, you cannot hookwink consumers in the Internet age. The user wants speed, quality and affordable packages and let’s not lose the moment to do it right this time around. PETALING JAYA: A mobile/cellular gamble may be the next thing that Telekom Malaysia Bhd (TM) will have to consider getting itself into if it wants to enhance its existing triple play offering. But TM will have to wait till early next year as it had in 2008 signed an agreement with Axiata Group Bhd that forbids it to get involved in the cellular business. However, early next year it will be free of that bond and it can either get into the cellular business by building a network or work with existing players to offer the missing link which is the cellular/mobile services to complement its triple play offering. If it so decides then it would be the only operator in the country to offer quadruple or quad play. A quadruple-play network is one that offers mobility in addition to the voice, data and video provided by a triple-play network. TM recently launched its high speed broadband services under the UniFi brand name and the company has bundled images via its Internet protocol TV (IPTV) offering. To complement that, it needs to add mobility solutions. UniFi is now available in four areas in the Klang Valley. “We are excited about UniFi and we will exploit it when the time comes. We have options to consider wireless (or cellular) technology to enhance what we have. To enhance UniFi we could use some other (player’s) network, have a technology partner or even build it ourselves (to bundle the services),’’ he told StarBiz in an interview recently. Spectrum-wise, the company is sitting on the 450 and 800 Mhz spectrum, but whether these could be used for fourth generation offerings is unclear should TM decide to build its own network. But TM’s re-entry into the cellular world would also seem odd as it had been in and out of it and the whole idea of the demerger was to have a dedicated cellular company for mobile play. However, technological advancements and consumer behavioural changes are driving convergence and mobility has become increasingly important in our daily lives. TM’s entry into the cellular world began over three decades ago when it was first to offer cellular services in the country via Atur 450. Then entered Celcom with its cellular service in 1989 and Celcom was once upon a time also majority-owned by TM. In 2003 Celcom went back to TM’s stables. In 1993, to introduce competition into the market place, the Government awarded several licences to operators and in came Mobikom. Here again, TM was shareholder of Mobikom alongside Edaran Otomobil Nasional Bhd and PNB Equity Resource Corp Sdn Bhd. With so many licences dished out, the industry became fragmented and had to be consolidated. As a result, TM picked up Emartel (formerly owned by MRCB Telecommunications Sdn Bhd) cellular network as part of the industry’s consolidation and also ended up with Mobikom and Celcom in 1998 and 2003 respectively. Celcom, by that time, had ended up with national asset management company Pengurusan Danaharta Nasional Bhd. TM got out of the cellular business in 2008 in a demerger exercise. Its cellular business were hived off to Axiata, but it retained both the 450 and 800 Mhz spectrums. The 800 Mhz spectrum was with Mobikom which was embroiled in a legal suit during the demerger exercise. “Armed with a high-speed broadband, fixed line business network and IPTV offering, the next wave for TM is get into the cellular business. It would be a waste not to capitalise on the cellular business to complement broadband, video and voice businesses. Of course, it can be done via working partnerships with existing players. “Whatever it does this time, the offering has to be compelling and the bundling of cellular/mobile services has to complement broadband and voice,’’ said an analyst. While TM may be mulling over its move, Maxis Communications Bhd is all set for triple play with its offer today of a sneak peek into the future of its home offerings including IPTV. Maxis is a mobile player while its sister company, Astro, is into the broadcasting business on which it can rely for images for its IPTV offering. KUALA LUMPUR: Telekom Malaysia has extended its high-speed broadband (HSBB) service to 18 new areas nationwide beginning this month. The new areas include industrial sites such as Bayan Baru (Penang), Permas (Johor), Kulim Hi-Tech Park (Kedah) and additional Klang Valley locations such as Wangsa Maju, Puchong, Subang USJ, Sungai Buloh, Melawati, Kepong, Cyberjaya, Putrajaya and Damansara. These are in addition to the initial four areas where the broadband service is being offered, which are Shah Alam, Subang Jaya, Bangsar and Taman Tun Dr Ismail. Known as the UniFi service, the more than 4,700 early bird subscribers who have been enjoying the service for free since its March launch should also expect to begin paying for the service from July. The company’s HSBB programme director Ahmad Azhar Yahya, who announced the locations to reporters here on Friday, said new subscribers would not be charged for installation, equipment and activation fees. Prices for the high speed broadband service begin from RM149 for 5Mbps to RM899 for 20Mbps. The price range vary according to residential and business registrations. I was a happy user of Unifi until lately that I submitted my 2nd application for my another unit (apartment) in Subang Jaya. I was told that they have network issue and I find it hard to believe as this unit is just right next to my 1st unit. I am without internet access now as I am not sure if I should go ahead any apply for Streamyx or wait for them to resolve the issue. Wrote to them but the answer is just as good as no answer as they them don’t know when can their technical team fix this (or if they are even looking into this). So, I am sot sure if the Rakyat is going to be benefited from this very good initiative from the government??? I had subsribed for the 5MB service on June 2010 and on the first day itself their standard solution for the the IPTV would be to switch on and off. It is now more than 4 months and there are frequent interruptions to the IPTV with the standard solution proposed. They have absolutelly no customer service with promises of fixing it within 24-48 hrs be consistently broken including promises to call me to let me know the status. They even had the gall to give me fake names whenever I asked for their names – for all intents and purposes they have all my details on their computer and yet we not provided full names whenever they are deficient in their service. Every single call to the customer service is being charged so congratulations to TM for providing this service including a method of generating revenue. Absolutely a 3rd world mentality masquerading behind high tech services that they do not know how to maintain nor service. Don’t ever get UNIFI – they just give you a universal headache.